. 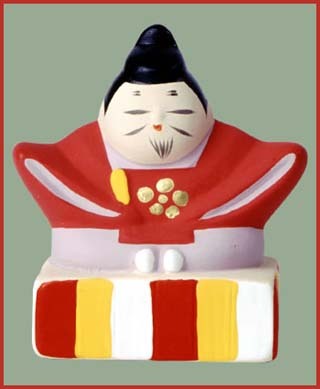 Sugawara Michizane Legends 天神菅原道真伝説 Legends about Tenjin . He is the deity of learning and very important to students when they need to pass an examination. 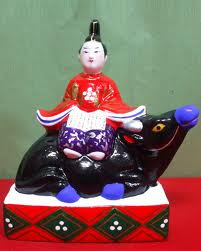 The bullfinch (鷽 uso) is believed to be Tenjin-sama's messenger. 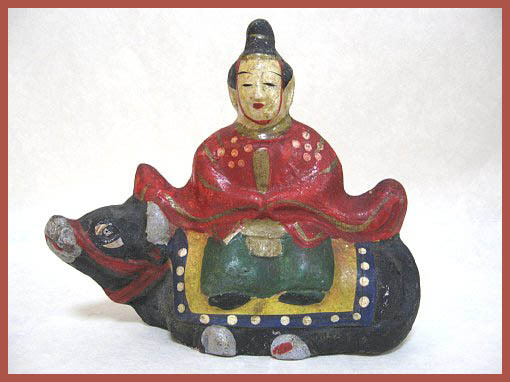 ushi hi koo 丑日講（うしひこう）"day of the ox"
baifuu koo 梅風講（ばいふうこう）"wind in the plums"
an offering at the Usa Jinja 宇佐神社. 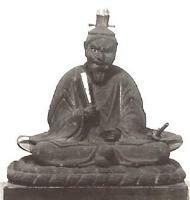 The killers sent by Fujiwara were still after Michizane and had come quite close. Thanks to the quick wit of an old woman he was saved. The woman hid him under her huge kitchen hearth. When the killers came, she told them she was just drying an old red soldier's coat (akaheko), so they searched elsewhere. 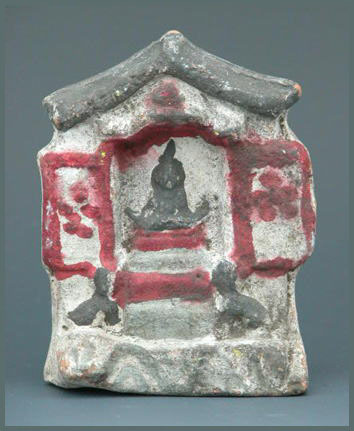 Some people now take the earth from the nearby Tenman Gu and put it around their home to prevent evil influences, fire and disaster. 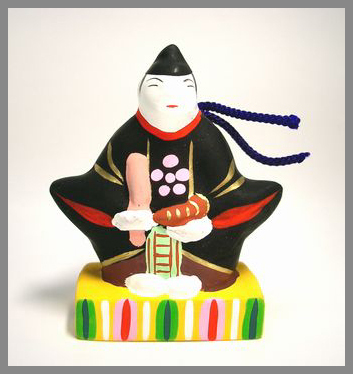 twisted by hand from 小川秀太 Ogawa Shuta from Kusu village. With two small Komainu guradian dogs at the side !
. 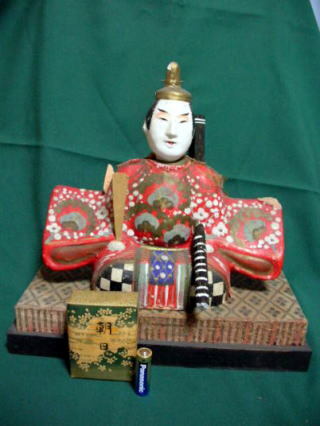 doro Tenjin 泥天神 "mud Tenjin"
. 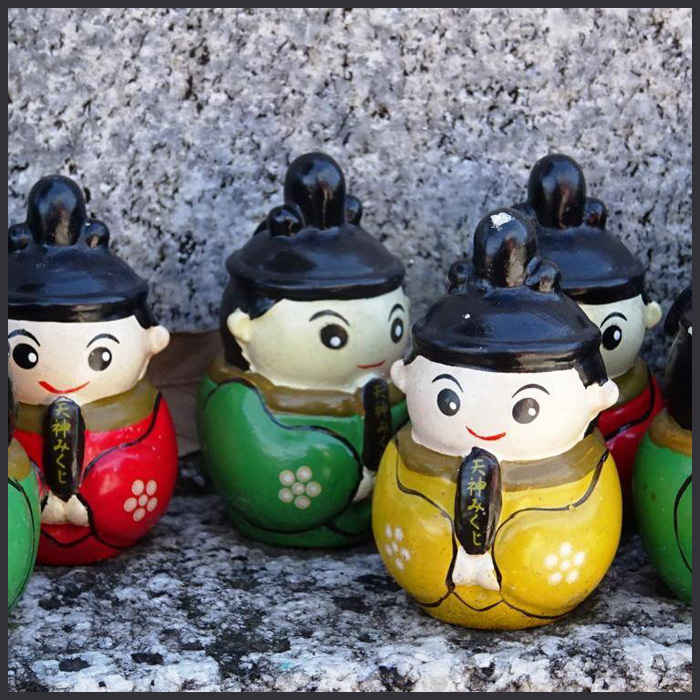 doro Tenjin 泥天神 from Tottori .
. Hiroshima 広島県 上下町 Joge Dolls .
. Kesennuma tsuchi ningyoo 気仙沼土人形 Tenjin clay dolls from Kesennuma .
. kushi tenjin 串天神 Tenjin sama on a stick . 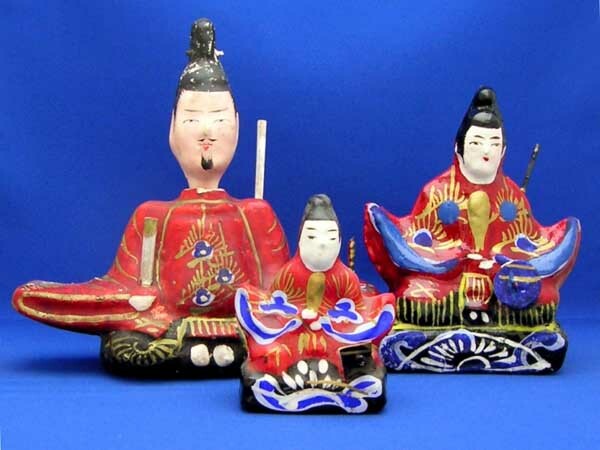 These dolls are decorated for the Hina Doll festival on March 3. 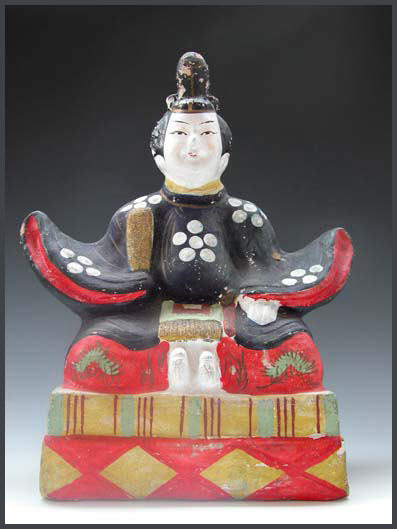 Around 1888, a doll maker from Hakata, 東倉市太郎 begun the tradition. In Matsuyama they are made by the 両村家 Futamura Family. 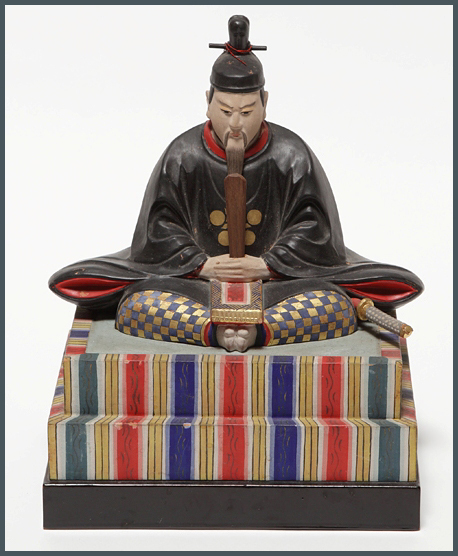 The model is the Isho Tenjin from Kyoto, 京都の衣裳天神. 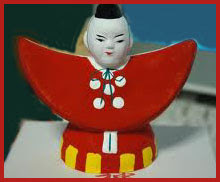 Similar dolls are known from Echigo 越後大浜.
. Kanagawa Folk Toys . CLICK for more Japanese photos 渡唐天神 ! 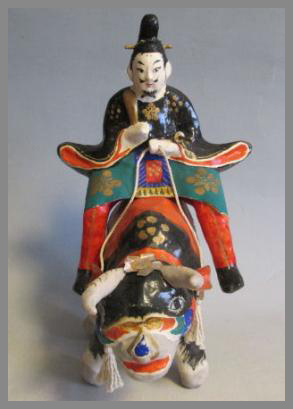 At the 富山市民俗民芸村 Museum it is sold with a small shrine 天神堂. There is also a scroll available 天神掛軸. 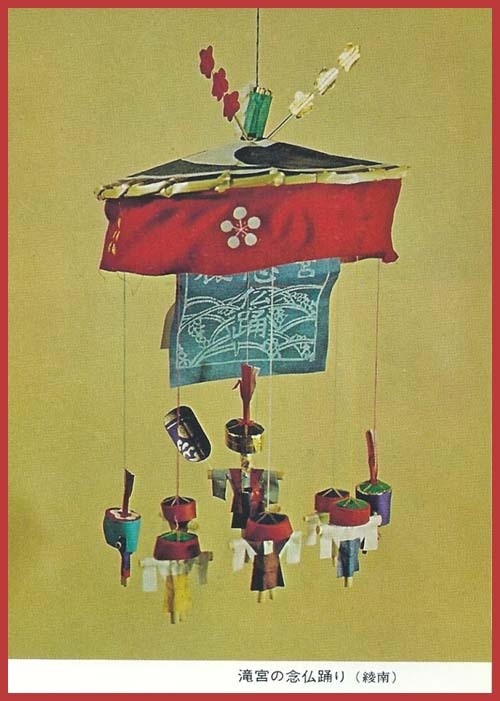 Many people of Toyama city decorate a Tenjin for special occasions, like the birth of the first son, when seeing off a bride and from December 25 to January 25 during the New Year celebrations. 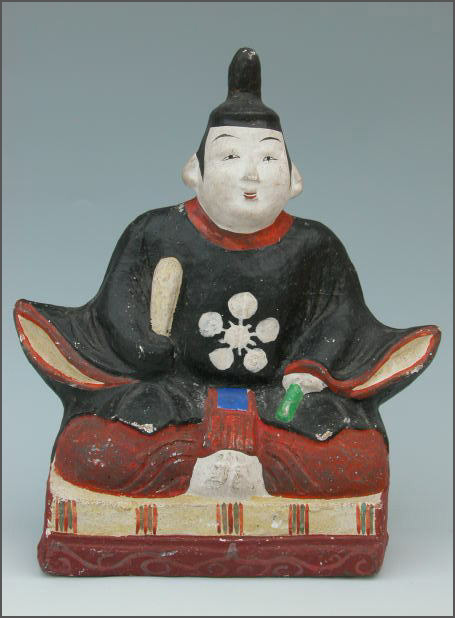 About 150 years ago, the local lord had brought some craftsmen from Nagoya to make clay dolls and support the local farming industry. 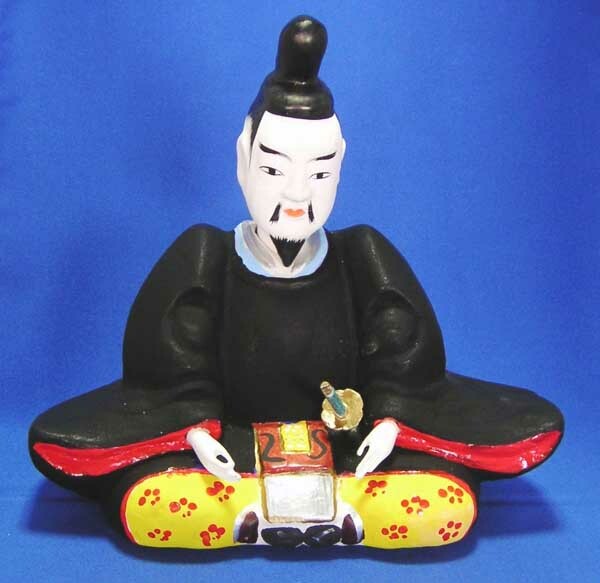 Nowadays stores selling Tenjin figures are rather rare. The shrine was moved to its current location in 1612 because Nagamasa Kuroda, the first lord of the Fukuoka Domain, wanted it to protect the northeastern gate of Fukuoka Castle. That is when it became known as Suikyo Tenmangu. Today, Suikyo Tenmangu is a quiet oasis amid towering modern office buildings. Suikyo Tenmangu Yokocho, the narrow alley next to the shrine, maintains an old-time atmosphere with a jumble of tiny restaurants. Not far from here are two other shrines dedicated to Michizane. Kagami Tenmangu, located next to Hakata Riverain, is said to be a spot where Michizane saw his reflection in a mirror upon arriving in Hakata. Just down the road, in Tsunabamachi, is Tsunahiki Tenmangu. It is built on the site where the newly arrived Michizane is said to have met some locals making rugs from rope. Originally called Tsunawa Tenjin, the shrine was later renamed Tsunahiki Tenmangu, and thus the neighborhood became known as Tsunabamachi. 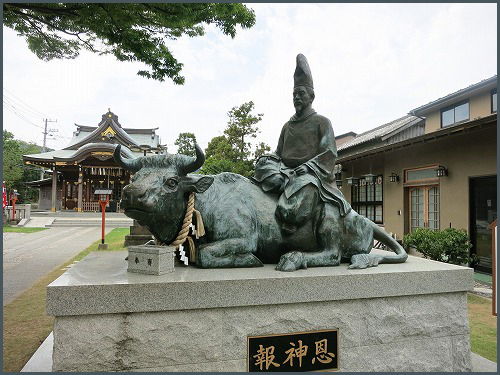 The cow is believed to be the messenger of Michizane.
. . . . . And he died at this remote land in Dazaifu in 903. 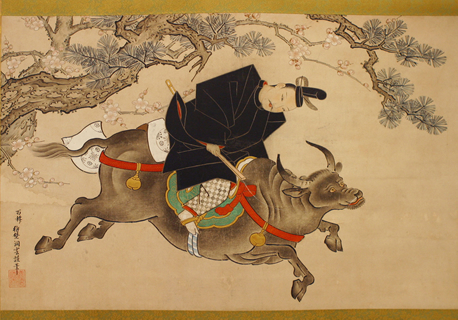 After his death, people tried to send his body to Kyoto by cow carriage. But the cow carrage was unable to move at the end of Dazaifu area. People thought that the soul of Michizane hoped to stay in Dazaifu. 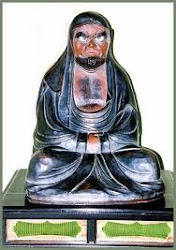 Then, his body was buried in Dazaifu and a mausoleum was built there in 905. The dance is held every year on August 25. 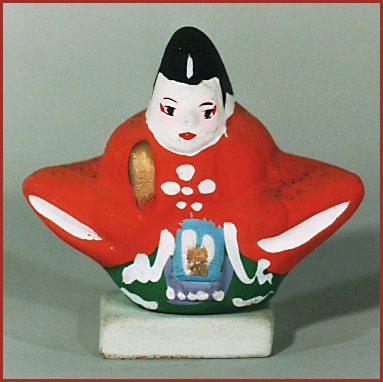 The dolls are made in its honor, they are about 20 cm high, dancing under an umbrella. There are nine straw dolls hanging down, moving and turning around if the wind blows. This dance started in 888, when a great drought happened in Sanuki and the local governor, Sugawara Michizane 菅原道真, ordered rain rituals and dances.
. Suitenguu 水天宮 Shrine of the Water God - Introduction . This is the Head Shrine of all the Suitengu shrines in Japan.